2) use the dropdown menu to select the price. Discount or preorder applies only to orders placed for upcoming print runs. 3) hit the Add to Cart button. If you prefer a payment method other than PayPal™ contact us by email at rsgmail@shaw.ca or use the contact form at the bottom of the page. 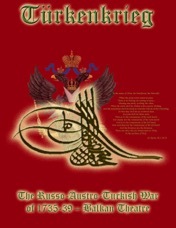 Türkenkrieg Second Edition (TK) is the fifth volume of Red Sash Games Lace Wars series. This two-player game opens a new subject, the little known war between the Russians and Austro-Habsburg led Imperials against the Ottoman Empire. A typical 'Cabinet War', it encapsulates many of the problems that would later dog Eastern European, and particularly Balkan, politics. The Russians were continuing their drive for a warm water port and egress from the Black Sea, while trying to stamp out the Crimean Tatars - notorious slavers and allies of the Ottoman Turks. They bullied the Turks into declaring war in 1735, then suffered reverse after reverse - mainly from the conditions in which they had to fight. To take the pressure off, they roped in the army of the Holy Roman Emperor, Charles VI of Habsburg, by virtue of a defensive alliance concocted in 1726. This treaty and this war would help cement an alliance between Austria and Russia that would last until the Crimean War. TK looks at the efforts of the Imperial Army in the Balkans from 1737 to 1739. Charles' military machine was already on its last legs after the disasters of the War of the Polish Succession (in which the Russians had bailed them out). But the dreaded forces of the Sultan were no better; he had only just concluded a crippling war with the Persia of Nadr Shah. In the end, the Turks would win through bluff and diplomacy. The Emperor's generals were fatally divided by service politics, but they agreed that only a defensive strategy was feasible - block the passes from Bulgaria by seizing the fortress of Nish, and block the Danube at the Iron Gates, isolating Muslim Bosnia and reducing it. Only Bosnia refused to be reduced. Mobilized by a dynamic ex-Grand Vizier named Ali Pasha, the Bosnian militia drove the invaders from their country. Threatened from the rear, the Imperial line of defense collapsed. Grimly, the two sides fought on, hoping for a bargaining chip that would settle the ongoing peace talks in their favour. 1738 was supposed to be the year of decision for the Turks, yet it turned into a stalemate. Fortunes swayed this way and that. The Ottomans were hampered by a two-front war. The Imperials were hampered by chronic malaria and an outbreak of bubonic plague that threatened to engulf the entire region. Nevertheless, by 1739, the writing was on the wall. The Turks defeated a rashly-led Imperial army at Grocka, only a days march from Belgrade, and then invested the city. Belgrade - Gateway to the Balkans, taken by the Imperials under the mighty Eugene of Savoy in 1718, heavily fortified, and made into a model German military colony. A bridgehead for the Imperials, it was also the lynchpin of their defense line. And it fell - fell through fear, not by storm or siege. The Emperor gave secret instructions to surrender the city if nothing else would serve to bring peace, and then indicted the men responsible for treason when they followed his instructions - how else to explain away his signing of a separate peace. In TK, you will have a chance to change history. As the Imperials, you command a respectable force, but led by generals who are split into two factions that hate each other. You must try to keep the Eastern Hordes locked up beyond the plains of Hungary and the Banat - and don't forget to cover the Transylvanian passes. Oh, and the 30,000 Bosnians in your rear. As the Ottomans you command a powerful force, divided into semi-feudal provincial armies who must periodically return to their farms, supported by your own personal army, the Kapikulu, or Slaves of the Porte. Your generals are also divided - some are pro-war, and some pro-peace. Your cavalry outmatches your enemy's, but your infantry, even the famed Janissaries, is poor stuff against an enemy who won't fight hand to hand. 1) Two map sections representing the Danube Basin from the Adriatic to the Black Sea coast. Scale is 8.5 miles per hex (roughly 4 leagues per hex). 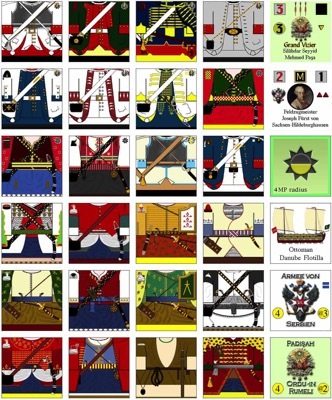 2) 1080 die cut counters representing contingents from Austria, Saxony, Bavaria, Hesse, Cologne, and other Holy Roman Empire states, and Modena, facing off against the Sultan's Army, Ottoman provincial forces from Bosnia, Rumelia, and Silistria, the Wallachians, and the dreaded Tatars. Scale is Battalion - that is, the playing pieces represent battalions and regiments or forces of an equivalent size. 3) Rules, charts, tables, and display cards.